We are pleased to present La India Contaminada, the gallery’s inaugural exhibition for Cecilia Vicuña. While the Chilean-born artist has lived in New York and exhibited widely in the United States and abroad for over three decades, this is the first comprehensive survey of her work in New York. The exhibition will feature Vicuña’s raw wool installation and sculpture known as Quipu, mixed-media sculptures referred to as Lo Precario, video, and painting, spanning 1969-2017. La India Contaminada will run concurrent with a solo exhibition exhibition of her Disappeared Quipu at the Brooklyn Museum, opening May 18, with her early performance and photographic work also included in the museum’s iteration of the traveling exhibition, Radical Women: Latin American Art, 1960–1985. Vicuña’s Quipu (translated as “knot” from Quechua) works reinvent the ancient Andean system that recorded statistics and narratives through the knotting of colored thread. Historically, the quipu has been regarded as a simple bureaucratic device, but research demonstrates they represented a complex system of knowledge with symbolic and virtual dimensions of enormous existential and social value that connected communities. Addressing this larger paradigm, Vicuña constructs her Quipus as poems in space. These tactile representations of the expansive interconnection of the cosmological and human realms relate her work to the Quantum Poetics movement that seeks to describe a reality that does not conform to standard perception. For Vicuña, Quantum Poetics are aligned with the indigenous worldview of the Americas. At its core her work is poetical and philosophical rather than anthropological. 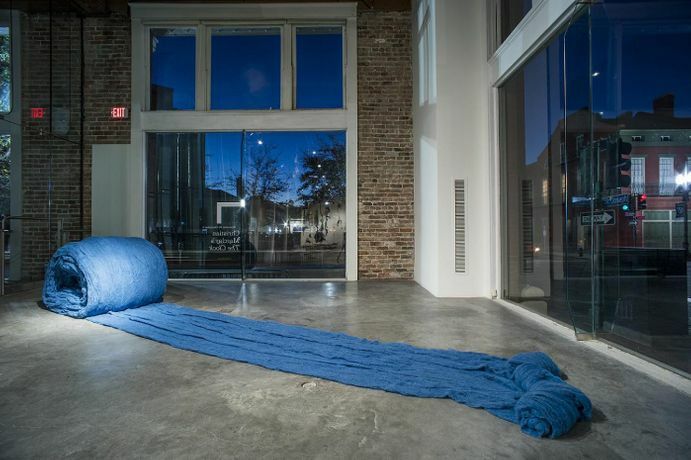 Vicuna’s use of dyed, raw and unprocessed wool, coiled in Caracol Azul (Blue Snail) (2017), or suspended as in Quipu Viscera (Visceral Quipu) (2017), creates a visual meditation on the liminal spaces between life and death, humans and nature, the past and the present, represented in the diffuse fibrous strands of wool. With our mutual fate now in question as we venture into the anthropocene, Vicuna’s Quipus serve as a reminder of the hubris that separates humanity from nature, asking us to reconsider our origins and interconnectedness. This cosmological connection is evident in another sculptural series, Lo Precario, “the precarious.” Each component—found scraps of cloth, shards of plastic, a feather, a leaf, a butterfly, a pencil—is included for its formal and representational potential. This gives each object infinite complexity on its own, a synecdoche of the larger installation as a whole, meant to be interpreted as a constellation. Originally, Vicuña composed these along the ocean’s shores, intended to disintegrate and wash away with high tide right after creation. She continues to perform this ritual in waterways around the world, while also bringing them indoors to display on walls and in vitrines, where the fragility of the composition and materials warns of their precarity.